BERLIN (Bloomberg) -- Audi plans to spend 13 billion euros ($17 billion) through 2016 to develop new cars and expand production capacity as it pursues BMW's lead. The Volkswagen AG unit budgeted more than 10.5 billion euros to develop vehicles and technologies, including lightweight auto design and electric powertrains, as part of the investment program, the carmaker said today in a statement. The spending includes funds for expanding production at its factory in Hungary, adding capacity in China and building a new plant in Mexico. "We will keep investing large sums to pursue our growth strategy," Chief Financial Officer Axel Strotbek said in the statement. "The expansion of our global manufacturing infrastructure will help us to continue growing." Audi aims to sell at least 2 million cars a year and overtake BMW by the end of the decade. The brand's expansion is part of Volkswagen's goal to become the world's largest automaker by 2018. 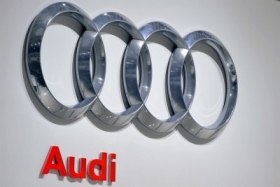 The manufacturer plans to spend 50.2 billion euros on its auto division, including Audi, through 2015. BMW is expected to widen its lead next year. The carmaker will increase sales 4.6 percent to 1.54 million vehicles in 2013, beating Audi's 1 percent growth to 1.44 million autos, according to estimates from industry researcher IHS Automotive. In November, the BMW brand increased sales 26 percent to 145,452 cars and sport-utility vehicles. That compares with growth of 11 percent to 123,600 deliveries at Audi and 5.7 percent to 120,346 vehicles at Mercedes.